I know what you’re thinking, but don’t worry, they’re all there, even the S! 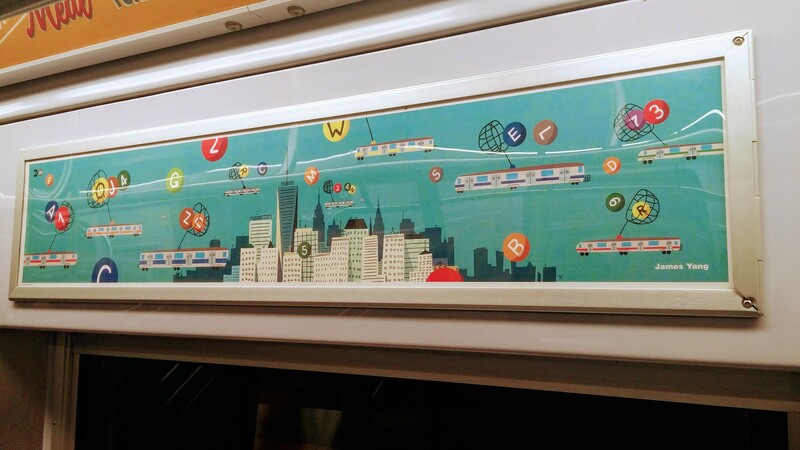 I saw this MTA subway art card for the first time back in March, and have continued to see it on various trains since then. Called “Catching Lines,” the piece was created by Brooklyn-based artist James Yang. His inspiration for this piece came from overhearing people giving subway directions, the result sounding to him as a Jetsons-like world of train lines floating above New York City. I’d totally be okay with having trains fly. Do you know how much faster I’d get to work every morning? I mean, unless the MTA figures out a way to make signal malfunctions a thing in the sky too, it could be pretty awesome. I just have one question for James Yang: What’s with the R being the only line showing up twice? See more of Yang’s art at www.jamesyang.com, and you can buy “Catching Lines” here.